“I think you are crazy. All the war makers want is oil. You are wasting your time. 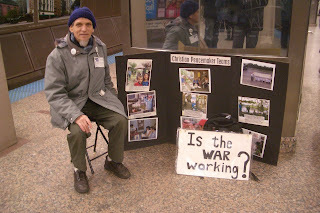 You don’t have a chance to bring peace in the world.” Thus responded John after he had listened to my sharing about CPT peacemaking in the Jackson subway station here in Chicago. John went on to say, “I am an agnostic.” I responded, “I was an agnostic for a number of years back in the early 70’s. Then one time, when visiting a pastor friend, I shared that I just could not say with integrity that I believed all that stuff about God. He said to me “Well, don’t try to fool God - you can’t. But if you want to believe, ask for it.” That was a milestone for me and the beginning of my ever-growing faith. Here I am in the Jackson subway station with my display board of photos to go with the stories I share with travelers. I go at least once a week. It is a good venue, keeps me on my toes, for I never know with whom I will be sharing. As many as 20 persons an hour take my literature packet, which includes how they can contact their senators, congressperson and President Obama all with one click of the computer. -My preparation for my upcoming April and May trip to Colombia to encourage the Mennonite Brethren churches to be peacemakers and also to set up interviews for Paul Alexander for his book about Christians following their call to work in justice and peace.